Some people might think that looking for indoor Easter egg hunt ideas is stupid. Really! As I was researching for this post, I came across many people saying things like “Just send them outside! A little rain never hurt anyone!” I mean, these women were downright MEAN to the innocent mom who simply asked for some indoor ideas. But seriously, there are SO MANY reasons that you might want to have an indoor Easter egg hunt! You live in the city and don’t have a yard, and you really don’t want to take your child to a public Easter egg hunt where there are moms trampling your kid so that her kid can get the most eggs. I’ve seen it happen. 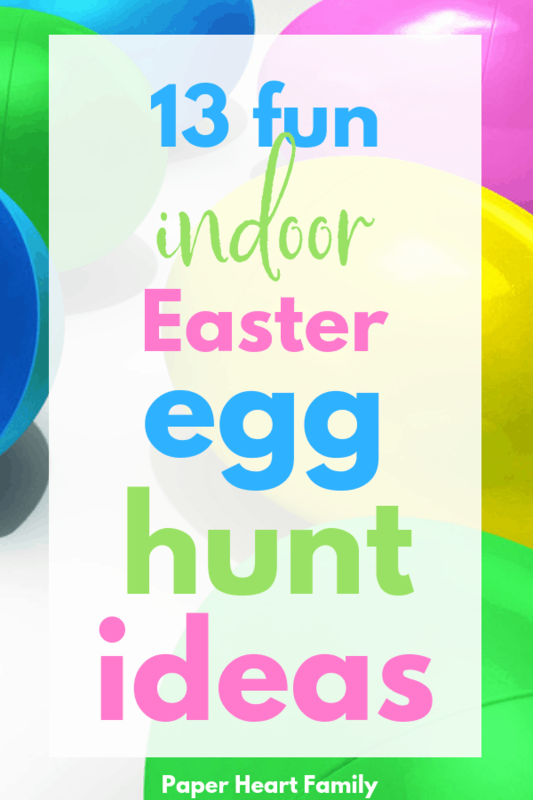 It is pouring cats and dogs and you need some simple indoor Easter egg hunt ideas FAST so that your well-organized egg hunt isn’t completely ruined. It is WAY too cold, which is completely possible in some parts of the country, even if it’s not where you live. You have a toddler who will be participating in her very first Easter egg hunt and you want her to have some practice so that she knows what in the world she’s doing! Check out the best toddler Easter egg hunt ideas. Your kids are driving you crazy and you just want (no, no, no, NEED) a new, interesting activity for them so that they will stop fighting with each other for 2 seconds. Your kids love Easter egg hunts and one just isn’t enough. See, there are plenty of reasons why Easter egg hunts, even indoor ones, are totally cool. Most of these egg hunt ideas can be thrown together quickly for a last minute Easter activity. Enjoy! Make sure to check out the BEST Easter egg filler ideas too. I just introduced this one to my kids and they are OBSESSED. It was inspired by their current favorite activity, Hide And Seek in the dark. Since we started playing this version of Hide and Seek, we have played it as a family every single night for the past two weeks. It’s simple. This egg hunt is the same as what you’re used to, but you do it in the dark. Arm your kids with flashlights and send them searching. Similar to the first idea, but now you add glow sticks into each plastic egg. Your kids might still need to use flashlights, unless you’re hiding them all in the same room and out in the open, which is also an option. If you don’t have glow sticks, you could also use tea lights. You can check out this idea on my toddler Easter egg hunt post. Basically, you need a parachute, flat sheet or tablecloth. You also need at least 4 participants. Next, you place all of your plastic eggs into the center of your parachute, each person grabs an end and everyone starts shaking. This is definitely not a traditional “hunt”, but is perfect when younger children are involved who can’t find eggs that are hidden anyway. Your kids will want to do this one, over and over and over. Write some simple clues, or draw pictures for non-readers, on slips of paper to put inside the eggs. Your kids can work together to solve the clues of to use the pictures in order to find the hidden eggs. For this variation, think about hiding your eggs in a way that is very challenging for your age group. Then, direct them by saying hot (when they are close to an egg) or cold (when far away). For older children, you can add in the use of a blindfold to really make it interesting. Make a list of physical activities (hop 10 times, do 15 jumping jacks, touch your toes 7 times, etc). You kids should find one egg, bring it over to the list, and complete the first activity. Next, your child should find a second egg and complete the second activity. By the end, your child will probably be out of breath. Put together a small puzzle. Then, flip it over and write a clue on the back. Place one puzzle piece inside each egg, then hide them. As your child finds the eggs, she should take out the puzzle piece and attempt to put it together. Once the entire puzzle is assembled, your child should carefully flip it over to read the clue on the back. The clue will lead to a small gift or the golden egg (with some kind of incentive inside). Assign each child a specific color egg. This could get really fun and promotes a lot of cooperation as your kids can help each other and encourage each other along. Let’s say that you are hiding 20 eggs. You should then have a stack of papers, numbered in order from 1-20. Chose one number to be the lucky number, let’s say 13. As your child finds an egg, she should run over and grab the slip of paper that is on the top. The child who finds the 13th egg gets a prize. I love this because it’s complete luck and there’s no strategy involved, meaning a younger child has just as much chance of winning as an older child. Why not have your kids hide the eggs for each other? *Hint hint* This one is my favorite. And not just because I don’t have to do the hiding, but because it lets your children have some ownership over the activity, and allows them some pride when they hide an egg in a really good spot that no one can find. Make the traditional Easter egg hunt a little more challenging and a lot more fun by requiring your kids to hop, rather than walk, to find the eggs. Using something like a fun Easter egg hunt to review letters or numbers, math or sight words just makes learning a lot more enjoyable. Simply place whatever it is that your child is working on learning into each egg. At the end of the hunt, they must identify the letter or number, solve the math problem, or read the word. Get a bunch of solo cups and place them upside down throughout the house. Then, and this is key, place Easter eggs underneath SOME, not all, of the cups. Have your kids take turns to try to find the Easter eggs. 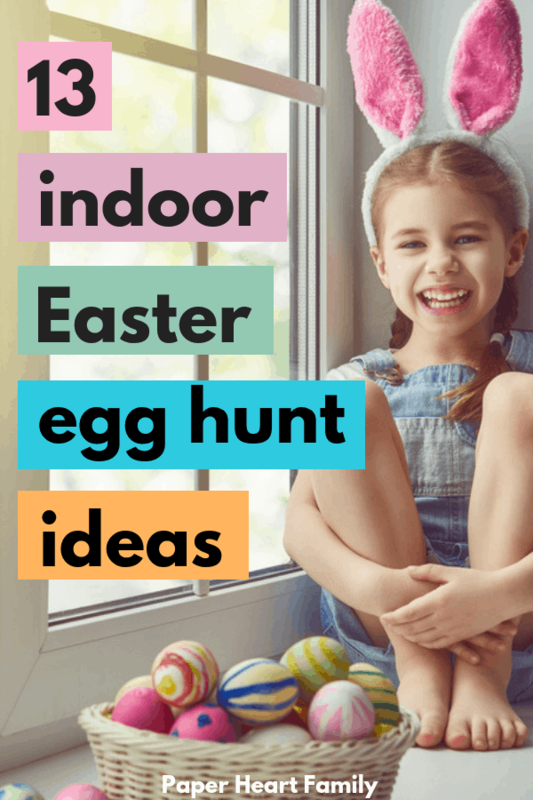 Have I convinced you that these indoor activities are the perfect indoor Easter egg hunt ideas? Thanks, Tammy! I’m so glad you like this Easter egg hunt idea. I understand the muddy factor. We might have the same issue here at my house as well unfortunately. Congrats on your grandbaby! That’s amazing!